Find out how to add content to a Blink or TritonLink page. 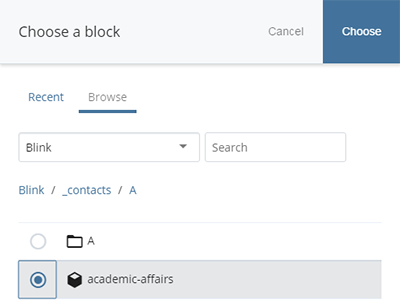 When you click Edit on a page in Blink or TritonLink the Edit screen will pop-up, showing the fields you can edit for that page. Intro: Type in a one-sentence description of the page. It will automatically show up in the subhead font. Note: This is often the same content as in the Summary field (see metadata). Image: You can upload a decorative image here. Alt Text: if you do upload an image, enter alt text here. This is mandatory for accessibility. Image-Alignment: The image will be aligned to the right of the text by default. Article template: Enter the main content here. You can use the WYSIWYG editor or enter code directly through the HTML view. Drawer template: The body area in the drawer template is for any content that needs to appear between the intro and the first drawer. Drawer Title: Enter the title for that section. Keep it as short as possible (text only-no formatting). This is automatically a heading 2 and will become an anchor link. Drawer Body: Enter any type of content here. Note: Do not use heading 2 inside the drawer. This will cause an error. Start with heading 3 inside a drawer. Learn more about headings. The template will have 1 drawer by default: To add a new drawer, click the plus sign above the drawer title. To delete a drawer, click the red X symbol. You can also reorder drawers by using the up and down arrows. FAQ template: The body area in the FAQ template is for any content that needs to appear between the intro and the first section. Section Heading: Enter a description for that section. If you only have one section, enter "Frequently Asked Questions". Question: Enter the question here (text only-no formatting). Answer: Enter the answer here. questions by using the up and down arrows. Enter contact information here. It will automatically show up in the green box. Do not use paragraph formatting here because it will create an extra line of space under the text. 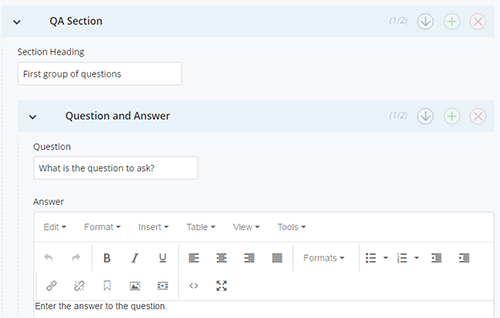 To fix this, select the text and use the WYSIWYG to choose Formatting >> Clear Formatting. Additional Content: If your content needs to show up after the green "contact" box, it shows up here. Disclaimer: If your page includes a disclaimer, choose the block here. 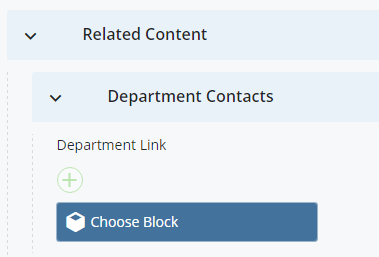 Related Content >> Department Contacts: This is where you choose a departmental home page link to show up in the blue "Departments" box underneath the left-hand navigation. 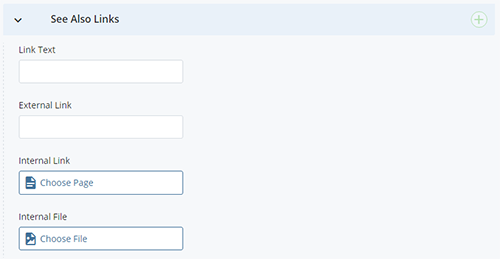 If you need to add multiple Department Contacts, click the plus sign. Click Browse to navigate to the /_contacts folder. Related Content >> See Also Links: Enter links here for related content (other Blink pages, files, links to OP, etc.) to show up in the orange "See Also" box. Type in the link text and then type in the URL for external links or use Choose Page or Choose File to select an internal link or file. Use the plus sign to add additional "See Also" links. We recommend that you use these links sparingly. Enter any editorial or internal notes. This won't show up on the page. Click Save & Preview to save your draft. Click Submit to save the page in the CMS and prepare for publishing.